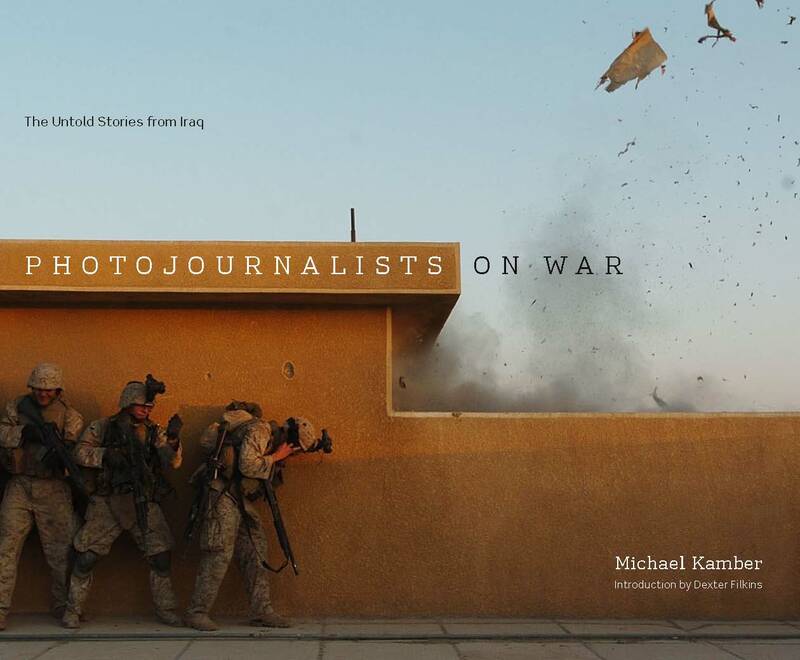 With previously unpublished photographs by an incredibly diverse group of the world’s top news photographers, Photojournalists on War presents a groundbreaking new visual and oral history of America’s nine-year conflict in the Middle East. 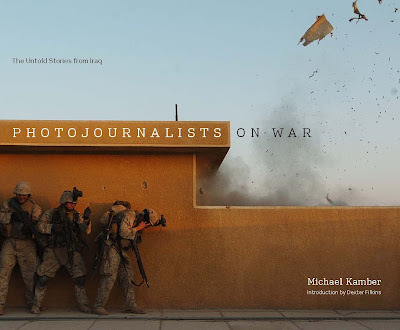 Michael Kamber interviewed photojournalists from many leading news organizations, including Agence France-Presse, the Associated Press, the Guardian, The Los Angeles Times, Magnum, Newsweek, The New York Times, Paris Match, Reuters, Time magazine, VII Photo Agency and The Washington Post to create the most comprehensive collection of eyewitness accounts of the Iraq War yet published. These in-depth interviews offer first-person, frontline reports of the war as it unfolded, including key moments such as the battle for Fallujah, the toppling of Saddam’s statue, and the Haditha massacre. The photographers also vividly describe the often shocking and sometimes heroic actions that journalists undertook in trying to cover the war, and discuss the role of the media and issues of censorship. These hard-hitting accounts and photographs, rare in the annals of any war, reveal the inside and untold stories behind the headlines in Iraq. Only 30 signed and numbered special edition copies available. Pay now and reserve your copy. Each book is accompanied by a signed 8×10 inkjet print of Joao Silva’s ‘Sniper’. Each book is signed by five photojournalists interviewed in the book. Each book comes in presentation box. Full details and ordering information here. NY Times Lens Blog: "It is a brutally honest account of the war in Iraq from the point of view of the men and women who photographed it." --This important book is almost ready for publication. Subscription of these 30 special-edition books will clear the final financial hurdle to publication. Monroe Gallery has placed our orders, please consider placing yours! "It is neither a police officer’s duty or right to decide what is appropriate news coverage of any story"
It is neither a police officer’s duty or right to decide what is appropriate news coverage of any story. So long as news personnel are in a public forum and not violating any ordinances they have a right to gather news unfettered by the personal feelings or opinions of law enforcement. Anything less may be considered a form of prior restraint or censorship. It is all well and good that the police set-up a media staging area but that does not mean it is the only place that media are allowed to be. They can go wherever the public is allowed, which in this case is outside of the "crime scene" perimeter. To expand that area for the sole purpose to preventing photographs or video recording is not a reasonable time, place and manner restriction and limits more First Amendment protected activity than is necessary to achieve a governmental purpose. All across the nation today, America’s LGBT population and their friends, family, and allies will unite in parades across the country celebrating the yearly tradition of Pride, always the last weekend in June to commemorate the Stonewall Riots of 1969, widely recognized as the first gay rights manifestation. In the spring of 1963, Steve McQueen was on the brink of superstardom, already popular from his big-screen breakout as one of The Magnificent Seven and just a couple months away from entering the Badass Hall of Fame with the release of The Great Escape. 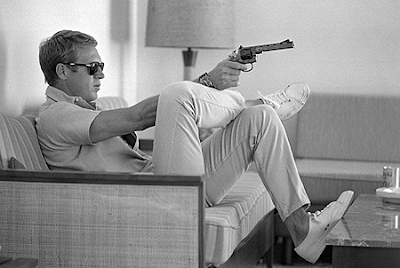 Intrigued by his dramatic backstory and his off-screen exploits — McQueen was a reformed delinquent who got his thrills racing cars and motorcycles — LIFE sent the great photographer John Dominis to California to hang out with the 33-year-old actor and, in effect, see what he could get. 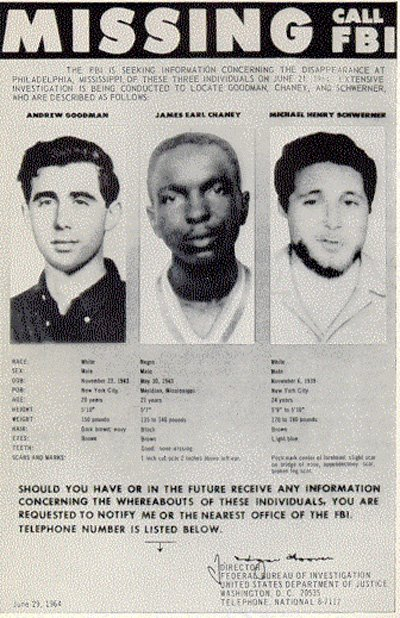 Today in News History: June 21, 1964: Three civil rights workers disappeared in Philadelphia, Miss. Today in News History: June 21, 1964: Three civil rights workers disappeared in Philadelphia, Miss. Their bodies were found buried in an earthen dam six weeks later. 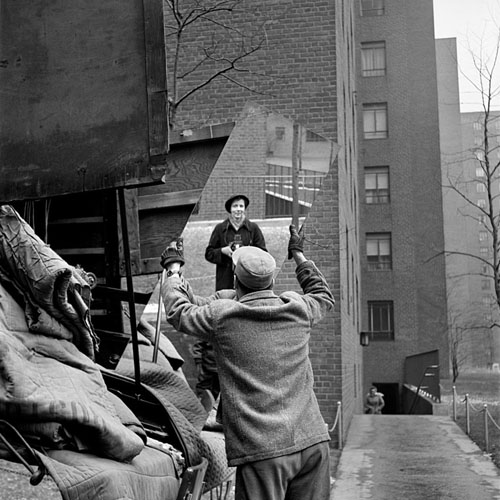 "We can’t know the full story behind this self-portrait, or behind the many thousands of images left in a storage locker in Chicago. But we can look at the range of Maier’s work and see the tantalizing evidence of artistry and ambition, and we can look at the expression of the woman reflected in the sheet mirror and see her indisputable pleasure. This is no frumpy old bird woman looking at her own pathetic destiny. This is a woman who knows what she wants, who has chosen to do her work free of judgment and commerce, and who is in charge of the scene." Full article here. Theme for 2012: Refugees have no choice. You do. "I looked, and I did something that you should never do. I didn't take a picture." You can thank Richard Nixon for making Father's Day and official holiday. Santa Fe (June 13, 2012)—Mysterious, artistic, and as low-tech as an oatmeal box, pinhole photography has captivated everyone from schoolchildren to professional photographers for more than a century. The Pinhole Resource Archives, the world’s largest collection of images, books and cameras, just joined New Mexico’s largest archive of photography, the Palace of the Governors Photo Archives at the New Mexico History Museum. The collection was a donation from Pinhole Resource Inc., which is based in New Mexico and led by Eric Renner and Nancy Spencer. “In looking at other possible repositories for the Pinhole Resource Collection, we felt the Palace of the Governors Photo Archives had a tremendous web presence, which would make the collection accessible to people worldwide,” Renner and Spencer said in a prepared statement. “In addition, with the staff’s enthusiasm and interest in pinhole images we felt the collection would have a good home here in New Mexico." The Photo Archives has already digitized hundreds of the images, which can be searched here (http://econtent.unm.edu/cdm4/indexpg.php ); click on “Browse Pinhole Resource Collection” or type the word “Pinhole” into the search box. 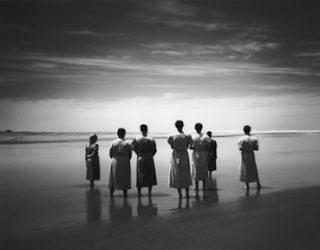 In 2014, the museum will mount an exhibition, Poetics of Light, celebrating pinhole photography. “The Photo Archives and the state of New Mexico is fortunate to be the repository for this world-class collection of pinhole photography. There is no other collection like it and is a tremendous addition to the resources made available to the public through the Photo Archives,” said archivist Daniel Kosharek. Even in this digital age, pinhole photography remains an intriguing medium. Its popularity has been celebrated every April since 2001 with Worldwide Pinhole Photography Day. The 2010 event drew 3,387 images from 67 countries. 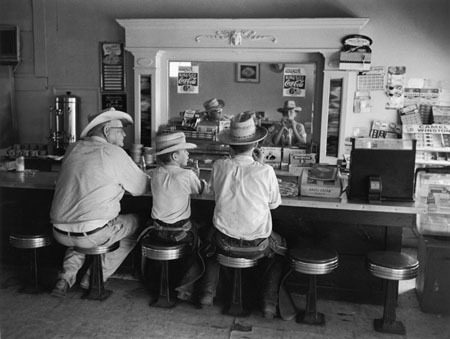 An exhibition of images from this unparalleled collection of pinhole photographs, representing images from New Mexico and around the world, is scheduled for April 2014 at the New Mexico History Museum. Poetics of Light will coincide with Worldwide Pinhole Photography Day. In the 5th century BC, a Chinese philosopher noted the inverted image produced through a pinhole—an effect that led to development of the camera obscura and serves as the fundamental quality of pinhole photography. Renaissance artists Leonardo da Vinci, Filippo Brunelleschi, and Leon Battista Alberti advanced the knowledge of pinhole camera obscura imagery, creating a basis and understand of one-point perspective. In 1850, Sir David Brewster, a Scottish scientist, took the first photograph with a pinhole camera. By the mid-1980s, a variety of pinhole cameras could be purchased by anyone who wanted to create images without creating the camera. In its most simple description, a pinhole camera is a lens-less camera with a small aperture. The interior of the “camera” (which can be, yes, an oatmeal box…or a traffic cone…or the human mouth…) contains a piece of film that records the projected image over periods of time that can range from a second to a year. Pinhole Resource Inc., a nonprofit organization dedicated to pinhole photography across the globe, was formed in New Mexico in 1984 by Eric Renner. He began working in pinhole photography in 1968, while teaching three-dimensional design for the State University of New York at Alfred. Images from his 6 pinhole panoramic camera were shown in the first exhibition of the Visual Studies Workshop Gallery in Rochester, New York. Consequently, one of Renner’s images was included in the Time-Life Series The Art of Photography, 1971. Through exhibitions and workshops, he met pinhole artists throughout the world and worried that their work might become as lost as the thousands of images taken during the Pictorial Movement from the late 1880s to early 1900s. The Palace of the Governors Photo Archives contains more than 800,000 prints, cased photographs, glass plate negatives, stereographs, photo postcards, lantern slides and more. Almost 20,000 images can be keyword searched on its website. The materials date from approximately 1850 to the present and cover the history and people of New Mexico from some of the most important 19th- and 20th-century photographers of the West—Adolph Bandelier, George C. Bennett, John Candelario, W.H. Cobb, Edward S. Curtis, Charles Lindbergh, Jesse Nusbaum, T. Harmon Parkhurst, Ben Wittick, and many others. The Archives actively seeks material from contemporary photographers as well in order to document the past 50 years of visual history in New Mexico. Recent acquisitions include works by Jack Parsons, Herbert A. Lotz, Tony O’Brien, Steve Fitch, David Michael Kennedy, John Willis, Ann Bromberg, and Cary Herz. Image: Top, "Community," by Linda Pearson, 2002. Palace of the Governors Photo Archives HP.2012.15.357. The New Mexico History Museum is the newest addition to a campus that includes the Palace of the Governors, the oldest continuously occupied public building in the United States; Fray Angélico Chávez History Library; Palace of the Governors Photo Archives; the Press at the Palace of the Governors; and the Native American Artisans Program. Located at 113 Lincoln Ave., in Santa Fe, NM, it is a division of the Department of Cultural Affairs. “That the First Amendment right to gather news is . . . not one that inures solely to the benefit of the news media; rather, the public’s right of access to information is coextensive with that of the press"
"I read with disappointing disbelief your recent statement in the Queens Chronicle “that only one journalist was arrested during the operation, despite stories to the contrary,” which you called “a total myth.” I also found it incredulous that given our media coalition letter of November 21, 2011, which addressed the arrests of journalists in and around Zuccotti Park; and during our meeting with you and Commissioner Kelly on November 23, 2011, no one ever raised the issue that “Occupy Wall Street protesters were forging press credentials in an effort to get through the police lines.” To hear you now deny your department’s culpability by claiming that “actual reporters” were not arrested is an absolute revision of history and is more appropriate as part of “1984 Newspeak” than coming from the Deputy Commissioner for Public Information for the NYPD." "After becoming the epicenter for press suppression and journalist arrests over the last nine months, the NYPD is trying to rewrite history and pretend like nothing ever happened." February 1, 2012: The New York Times fired off another letter to the Police Department today on behalf of 13 New York-based news organizations about police treatment of the press over the last several months. November 18, 2011: As faculty members of the Columbia University Graduate School of Journalism, we are alarmed at the arrests of working news professionals during the ongoing Occupy Wall Street protests, and deeply concerned that the NYPD blocked reporters' and photographers' access to Zuccotti Park during the recent eviction of the Occupy Wall Street encampment. Jonathan Rashad is a Cairo-based photojournalist covering the Egyptian Uprising. He was in Egyptian custody for 54 days for covering clashes near Interior Ministry. 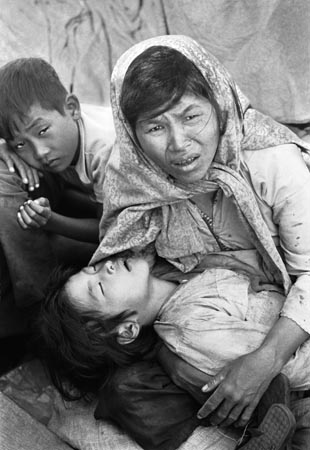 June 5, 1968: “How many people died because of that assassination?" When the gunshots that mortally wounded Sen. Robert F. Kennedy rang out in a California hotel that fateful night 44 years ago, Life magazine photographer Bill Eppridge was right behind the Democratic presidential candidate. Eppridge didn’t panic or run; instead he did what he had risked his life to do in Vietnam—he took pictures and recorded history. “I was about 12 feet behind [Kennedy] and I heard the shots start,” Eppridge says in the living room of the New Milford home he shares with his wife, Adrienne. In his 70s, Eppridge has dark hair and a deep, penetrating stare. When he talks about his days with Kennedy he speaks slowly and deliberately, as if he’s reliving each moment. The assassination took place at the Ambassador Hotel in Los Angeles shortly after midnight on June 5, 1968. The shots were fired by 24-year-old Palestinian immigrant Sirhan Sirhan, and Eppridge himself was nearly hit by a stray bullet. Among the photographs Eppridge took that night is the haunting image of a fallen Kennedy being cradled in the arms of Juan Romero, an Ambassador Hotel busboy who had shaken hands with the candidate just moments before. 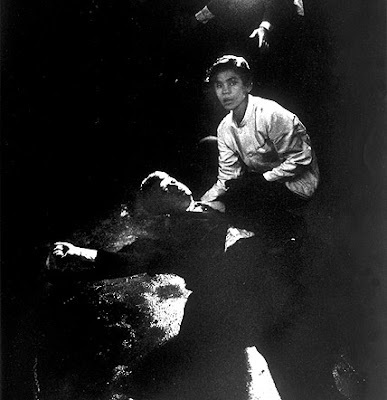 That powerful picture captured by Eppridge has become one of the enduring images of the assassination. “Barry knew the ropes and he knew that you don’t go out of a room the same way you came in,” Eppridge explains. He had photographed Kennedy two years earlier and on the campaign trail they’d become friends, but at first Eppridge could not take time to grieve for his fallen friend. “After Frank Mankiewicz [Kennedy’s press secretary] announced that Bobby was gone, I went back to New York and met the plane there when they brought him in, photographed the funeral at St. Patrick’s, took that train ride to Washington, and then I cried,” he says. If Kennedy hadn’t been murdered, Eppridge believes that history would have taken a vastly different course. “I don’t think people realize the significance of that assassination and what would have happened had he not been shot,” Eppridge says. He believes Kennedy would have became president instead of Republican Richard Nixon and would have ended the Vietnam War immediately—saving the lives of more than 20,000 American soldiers and tens of thousands of North and South Vietnamese soldiers and civilians. In addition to the tragic end of the Kennedy campaign, Eppridge covered many iconic moments in the 1960s for Life magazine, including the Beatles’ arrival in America in 1964 and the Woodstock music festival in 1969. In 2008, he compiled his photographs and wrote about his time with Kennedy in the book A Time It Was: Bobby Kennedy in the Sixties. Eppridge doesn’t subscribe to any of the many conspiracy theories surrounding the assassination, especially that there was a second gunman and more than eight shots fired that night. Besides security being light around the candidate, the campaign was very open, making Kennedy an easy target. Also, Sirhan is on record saying that he hated Kennedy because of his support of Israel. 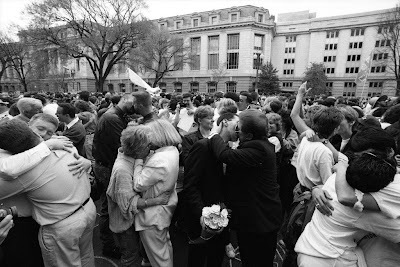 Related: Bill Eppridge: An American Treasure Review "An Eye On The Times"
Via ABC News: "China's internet censors have blocked words and phrases associated with yesterday's anniversary of the Tiananmen Square massacre. Key phrases relating to yesterday's date and expressions like "never forget" have been blocked by China's internet censors." Via BBC News: "China has detained political activists and placed others under increased surveillance in cities around the country to prevent them from marking the anniversary of the massacre in Tiananmen Square on Monday." Via VR Zone: In yet another crackdown on free speech, China has banned searches for terms relating to the 1989 Tiananmen Square massacre, where hundreds of pro-democracy protesters were killed by government forces. Forthcoming Exhibition: "People Get Ready: The Struggle For Human Rights"
"If you have the nerve to walk into the halls of Congress and show them the obscenity that is a child that must wash herself with poison every day, they will call you a child pornographer. They will call the police." New York City's No. 1 destination for thrill-seekers is in the middle of a high-dollar facelift. FORTUNE -- In 1938, at the height of Coney Island's popularity, Fortune reported that the "narrow strip of land, about 800 to 1,000 feet in width and two and a quarter miles long," was valued at about $22 million, or $337 million in today's dollars. But the strip is probably worth more than that: New York City expects the boardwalk to generate $14 billion in the next three decades. 11 million: Number of visitors to Coney Island last summer. Of those, 640,000 went to Luna Park and Scream Zone for the 26 rides -- the highest amusement park attendance since 1964. Two new rides will open this summer. $4.5 million: Sale price of the Eldorado Auto Skooters building, purchased this spring by Thor Equities. Thor now owns about seven acres of land in Coney Island, and plans to develop some of its properties into ritzy hotels. 90 mph: Top speed of the Sling Shot, Luna Park's fastest ride. The first roller coaster in the U.S. made its debut in Coney Island in 1884. It cost 5¢ to ride and topped out at 6 mph. The Sling Shot costs $20 a pop. Source: New York City Economic Development Corp. When photographer Nick Ut snapped the Pulitzer-winning image of Kim Phuc, neither knew what the next 40 years had in store. On Monday, June 4, the AP will be hosting a live Facebook chat with Nick at 2 p.m. EDT. Start asking your questions now on the AP Facebook page, and Nick may respond during the chat. Joe McNally: "That photo made on that horrible day was made in less than a second. Yet a lifetime spun on its power." NPR: "Whatever your age, you've probably seen this photo. 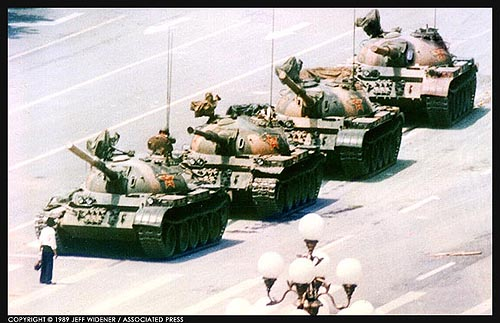 It's a hard image to forget"
"23 years after Tiananmen, China is still paying: The annual crackdown on commemorations of the June 4 anniversary of the brutal suppression of student-led demonstrations based in Tiananmen Square in 1989 Beijing is under way." reminds us that the right to freedom of expression also requires consistent defense. The belief that everyone, by virtue of her or his humanity, is entitled to certain human rights is fairly new. Its roots, however, lie in earlier traditions and documents of many cultures; however, it took the catalyst of World War II to propel human rights onto the global stage and into the global conscience. Photographers in this exhibition illustrate the power of photography to inform, persuade, enlighten and enrich the viewer's life. Many of the photographs featured in this exhibition not only moved the public at the time of their publication, and continue to have an impact today, but set social and political changes in motion, transforming the way we live and think. Many global human rights movements are documented in the exhibition, including: Civil Rights in America, Women's Rights, Democracy rights, People's rights, Worker's rights, Gay rights, and other causes. Also included are stark photographs of stalwart defenders of the-then status quo, from segregationists to proponents of sexism. 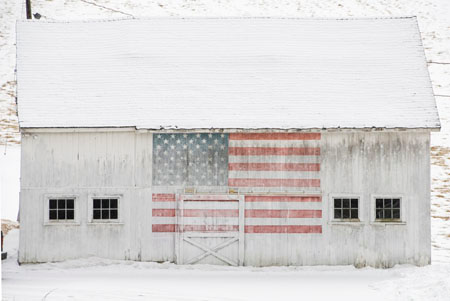 Photographers in the exhibition include: Eddie Adams, Nina Berman, Margart Bourke-White, Bill Eppridge, Ashley Gilbertson, Yuri Kozyrev, Ken Regan, Steve Schapiro, Paul Schutzer, Grey Villet, Jeff Widener, and numerous other renowned photojournalists.